A very pretty British selection of this spring blooming perennial. Tall stems produce large single ruffly solid orange.flowers. 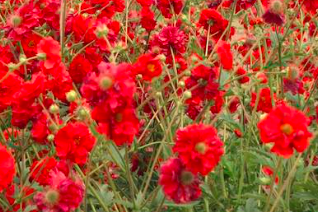 Multiple flowers are born on one stem. To 2′ tall and forming a patch as wide. Rich, well drained soil with regular summer moisture. Full sun to very light shade. Very easy long lived perennial. Wonderful flower color brightens spring borders beginning in April and extending to early July. Not bothered by pests or disease. 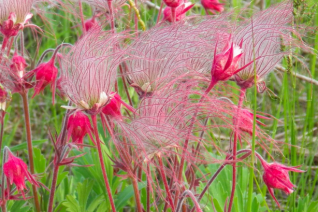 From one of our favorite mountain ranges in Oregon The Ochocos Greg spotted this great form of Prairie Smoke. 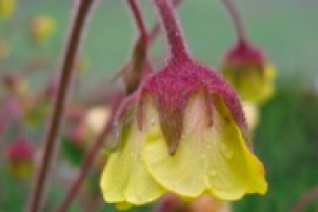 Pretty spreading perennial with gray green divided leaves and in summer upright then nodding pink fur covered buds that mostly overlap small pink petals. Its glory shines when these flowers go to seed. The stems turn straight up and fluffy silver seed heads puff up and wave in the breeze like smoke. Full sun and well drained soil of average fertility. Light summer water. To 2′ x 2′ slowly. Completely deciduous in winter. Ultra cold hardy Oregon native plant. Gems are so useful for us because they virtually laugh at heavy clay soils and still perform. 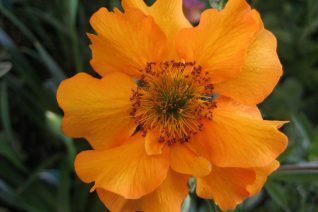 But better is rich amended soil and they will bloom- in the case of this cultivar almost non-stop through the heat of summer. 2′ tall divided spikes yield fully double large brilliant orange red flowers. Opulent but with a wildflower charm at the same time. A big ol branch of flowers makes a great cut flower that lasts for ore than a week. Full sun to light shade and regular summer water. Remove spent flowers to encourage more- and there will be quickly. Forms a substantial patch in a few years. Very long lived perennial. Match with blue flowered Salvias for a thrilling visual bonanza. Completely deciduous in winter.